More than a billion people in the developing world lack safe drinking water – an amenity those in the developed world take for granted. Nearly three billion people live without access to adequate sanitation systems necessary for reducing exposure to water-related diseases. The failure of the international aid community, nations, and local organizations to satisfy these basic human needs has led to substantial, unnecessary, and preventable human suffering. 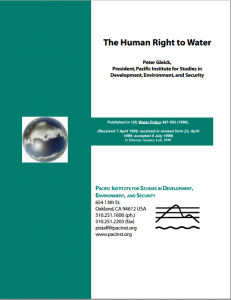 This paper argues that access to a basic water requirement is a fundamental human right implicitly and explicitly supported by international law, declarations, and State practice. Governments, international aid agencies, non-governmental organizations, and local communities should work to provide all humans with a basic water requirement and to guarantee that water as a human right. By acknowledging a human right to water and expressing the willingness to meet this right for those currently deprived of it, the water community would have a useful tool for addressing one of the most fundamental failures of 20th century development. international community, as can be seen by its recognition in some local customary laws or religious canon.